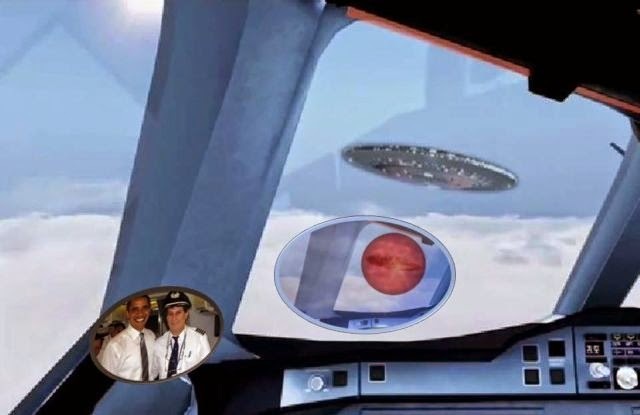 The aircraft captain revealed that nearly all pilots believe in UFOs. A pilot who contributes articles to New York Daily News, recently wrote an article about UFOs and commercial pilots, and he included his own incredible UFO sighting. The title of the article is “Do pilots believe in UFOs? Many of them do and here is my close encounter story,” and it is written by Andrew Danziger. According to New York Daily News, Danziger is a 28 year airline veteran. He has served as a captain on international flights for the last 14 years. He has also been an instructor, and was even one of President Obama’s pilots during the 2008 campaign. Here is an excerpt of his UFO encounter: (Read the full story Here and Here). It was April 10, 1989 and early in my career. After a short taxi and take-off, Air Traffic Control (ATC) cleared us to our cruise altitude of 15,000 feet. We established a Northeasterly heading, pointed strait at Waterloo, about 200 miles ahead. Despite the presence of these clearly visible wispy clouds everywhere, we weren’t flying through any of them. There was also a white disc dimly but clearly visible through those clouds just off to our right. We flew on and I commented to Bruce, the captain, about this dimly visible disc. He said that he’d been watching the same thing since we had leveled off. We spent 20 to 30 minutes at our cruise altitude, all the while staring at this white disc dimly visible through some clouds that we somehow never seemed to fly through. We got busy with our flying duties and for a short while, maybe for a minute, both of us had looked away from the disc, but when I looked up at it again I saw something that has been burned into my memory. Above the clouds, where the white disc had been, was a now giant red ball it was flying parallel to our course. We slowly lost altitude and at around 13,000 feet, the brightly glowing ball began a gradual descent, too. As it did, it slowly started disappearing behind those wispy clouds. In about 30 seconds, like a setting sun but not nearly as bright, it vanished behind the clouds. The instant it fully disappeared, hundreds of lights began flashing from within the clouds. The flashing lights were brighter than ever and I could see that the section of the cloud that the glowing red ball had descended behind was starting to stretch apart like a piece of “Silly Putty,” two halves being pulled slowly apart with the middle getting thinner and thinner. This continued until the halves grew so thin that it tore apart and, pop! Everything was gone.